TV show dates: January 7, 2019 — present. Performers include: Terry Crews (host); Simon Cowell, Mel B, Heidi Klum, and Howie Mandel (judges). The America’s Got Talent: The Champions TV show draws from favorite acts from the both the US program and the global America’s Got Talent TV series franchise. AGT: The Champions gathers some of the most impressive acts — from wacky fan favorites to standout performers — to compete against each other in an “Olympic-style” contest celebrating their creativity and performance chops. The “all-star” acts, including past winners and finalists, take the stage and battle for the ultimate title of World Champion. What do you think? Do you like the America’s Got Talent: The Champions TV series? Should this NBC TV show be cancelled or renewed for another season? 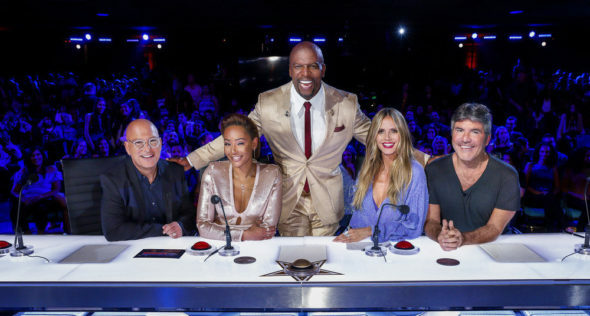 More about: America's Got Talent: The Champions: ratings, America’s Got Talent: The Champions, America’s Got Talent: The Champions: canceled or renewed?, NBC TV shows: canceled or renewed?